Teachers sampling an oil slick from a dingy in the Gulf of Mexico. Photo courtesy of CEISMC, AMP-IT-UP program. In late September, two teachers from Griffin-Spalding County Schools participating in the Georgia TechAMP-IT-UP program were given an opportunity to join a research expedition in the Gulf of Mexico. Cheryl Wilder from Kennedy Road Middle School and Kathy Duke from Rehoboth Road Middle School are seventh-grade life science teachers that received the chance to experience real-world research with ECOGIG (Ecosystem Impacts of Oil and Gas Inputs in the Gulf,) an organization founded by the Gulf of Mexico Research Initiative after the Deepwater Horizon oil spill in 2010. The research was relevant not only for the teachers but also for their students, who have been studying AMP-IT-UP curriculum modules on the Gulf ecosystems. The AMP-IT-UP (Advanced Manufacturing and Prototyping Integrated to Unlock Potential) program is a multi-year grant whose mission is to cultivate the next generation of creative science, technology, engineering, and mathematics (STEM) innovators. It is a collaborative partnership between Georgia Tech and Griffin-Spalding County Schools. The Center for Education Integrating Science, Mathematics, and Computing (CEISMC) has partnered with the School of Mechanical Engineering to design math and science modules that bring advanced manufacturing and STEM themes to middle and high school classrooms; for example, AMP-IT-UP teachers Duke and Wilder are teaching their seventh graders three modules on ocean ecology, two of which are based on ECOGIG research. Each module profiles a member of the Georgia Tech faculty, connecting students in Griffin to the cutting-edge research being done at Georgia Tech and at the University of Georgia. Dr. Annalisa Bracco, from the School of Earth and Atmospheric Sciences at Georgia Tech, is a principal investigator for ECOGIG who partnered with CEISMC to design these AMP-IT-UP modules and organized for the teachers to join the cruise. “It is not easy to find space on those cruises to help with research, and it was a great opportunity for them because they have been teaching modules specifically on that subject,” said Bracco. The teachers traveled to various sites throughout the Gulf, including to the GC600 site, which is a natural oil seep. According to Bracco, ECOGIG scientists, including the program's Assistant Director Dr. Joe Montoya at Georgia Tech, have found that there is increased biological activity in areas with natural oil seeps because the rising bubbles of oil also carry to the surface water that is rich in nutrients, which is beneficial to plankton. ECOGIG is able to measure the amount of productivity not only by measuring plankton but also by examining the amount of marine snow, or organic material, in that area; the amount of marine snow varies depending on proximity to natural seeps and seasons. “You can get it more in some seasons because you may have some Mississippi River water that contains a lot of nutrients from land, so the ocean gets fertilized, essentially,” said Bracco. While current measurements at GC600 are primarily from natural marine snow, polluting events such as the Deepwater Horizon oil spill can contribute to an increase in the phenomenon. Wilder described how going out to the different sites impacted her perspective on the Gulf of Mexico. “We went to three different sites, and it just blew my mind how you can go to one site and the water is pretty and blue, and go to another site and it is black,” said Wilder. “You could smell the oil and it was a very distinct odor,” she added. 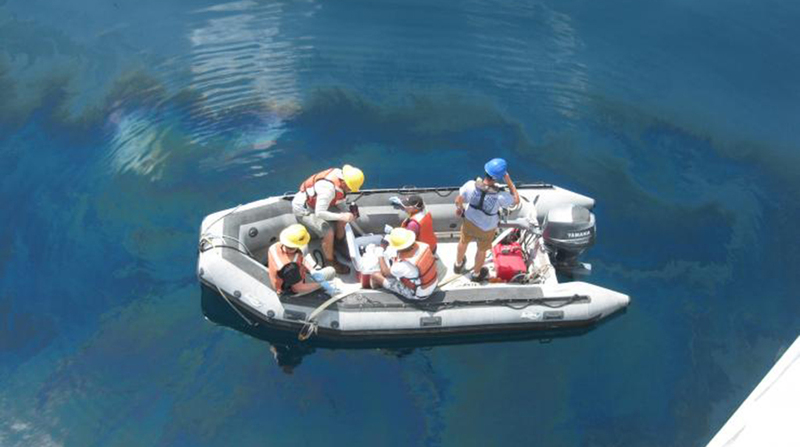 Both teachers were able to collect oil samples from the Taylor Energy Site, where there has been an ongoing oil spill since Hurricane Ivan in 2004 caused damage to the Mississippi Canyon 20-A production platform. Wilder and Duke plan to show the samples from the Taylor Energy Site to their students, who are even more excited about the classroom modules because of their teachers’ experiences.